Our mission is to hold structured weekly training sessions in a fun environment with each participant working towards realistic goals. All sessions will be led by our coach qualified to England Athletics Level 3. 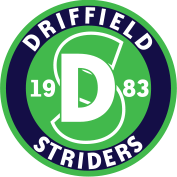 This is the eleventh year that Striders have organised activities for 6-16 year olds. The sessions include endurance and speed training, games and exercises aimed at improving co-ordination, balance and confidence. The sessions are held every Thursday evening during the summer term at 6-7pm. We meet at the track in the senior schools grounds. Junior Striders season 2018 has now finished. Provisional start date for 2019 25.04.19 watch this space for more information. To purchase junior striders running kit please visit H & K embroidery – orders can be taken online or in store. Adult runners wanting to take advantage of track training are also welcome to attend Striders senior sessions at the same time as the juniors. These are ideal for people new to running and just wanting to improve their fitness. A coached adult session is held from 7-8pm, after the junior session with the aim of developing running speed and technique. Either contact Paul Grinstead for more details (Tel. 01377 255272; email:p.grinstead2@btinternet.com) or just turn up on the night.